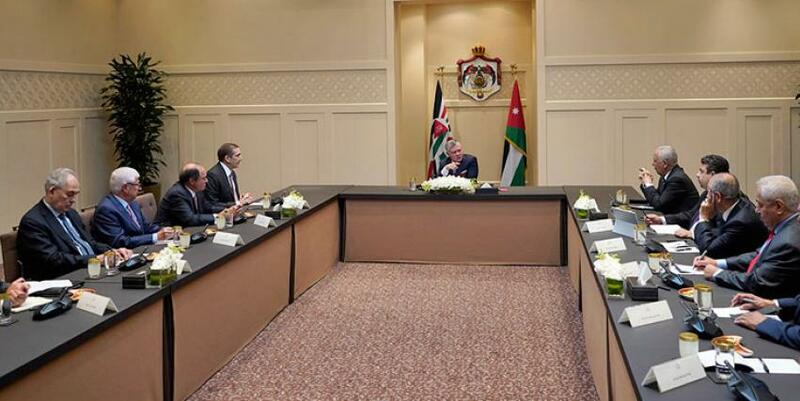 AMMAN — His Majesty King Abdullah on Sunday stressed that the “united and vigilant” Jordanian people will not be affected by agendas seeking to question Jordan, its institutions, future and security. “We as Jordanians must stand united in the face of those agendas,” King Abdullah said during a meeting with political and media figures at Al Husseiniya Palace, according to a Royal Court statement. His Majesty noted that at the same time every year, there are attempts to spread rumours on the alternative homeland and Jerusalem. “We know these attempts increase in the summer, so I must intervene to reassure all citizens,” the King said. “It is obvious that these are organised efforts by parties with clear agendas, working behind their screens to make citizens doubt the institutions and decisions of their country, while stoking fear in its future and security. This is, unfortunately, nothing new,” His Majesty added. The King said these parties mistakenly believe they can influence the united and vigilant Jordanian people, who put their country’s interests before all else. The meeting also covered economic conditions, with His Majesty stressing that the priority is to improve the economy and create job opportunities, the statement said. The King underscored the need to develop public-private partnerships to create the economic opportunities required to combat poverty and unemployment. Turning to efforts to develop political life in Jordan, His Majesty highlighted his meetings with parliamentary blocs and civil society institutions to discuss ideas to enhance partnership and increase citizen engagement in decision making. The King also stressed the importance of the trilateral Jordan-Egypt-Iraq summit and the need to build on it in service of joint Arab action. Discussing the Palestinian cause, His Majesty said Jordan’s position is clear and steadfast, despite all challenges. The King also affirmed Jordan’s commitment to bolstering joint Arab action, which was stressed at the Tunis Arab summit, the statement added. His Majesty noted Jordan’s distinguished ties with Arab and foreign countries, adding that all respect Jordan, its positions, and efforts. The political and media figures focused on domestic and regional issues, calling for clear media messaging and noting that former officials must help defend Jordan and its honourable positions while reaching out to citizens and contributing positively to the public debate. They stressed the need for positive messages to highlight Jordan’s achievements while also providing the public with timely information and facts to counter distortions and attempts to spread pessimism, frustration and doubt. Calling for nurturing a culture of fact checking, they said rumour mongers have their own agendas and must be countered on social media, according to the statement. The attendees commended His Majesty’s clear positions on the Palestinian cause and Jerusalem, affirming that Jordanians stand with the King in defending the legitimate rights of the Palestinian people. Jordan, led by His Majesty, is respected by the world for its positions on regional issues and its efforts towards peace, tolerance, and harmony, they added, citing the international prizes awarded to the King. Turning to efforts to enhance political and partisan life, the attendees said governments should work to implement the principles of His Majesty’s discussion papers, the Royal Court added. They noted the substantial progress of Jordan’s economy under the King, stressing the need to counter false information on economic conditions with facts and figures. The political and media figures underscored the importance of improving citizens’ standard of living, bolstering the middle class, supporting entrepreneurship and innovation programmes and addressing the tax burden from a holistic perspective. They also called on promoting investments and steering investors towards the governorates, while activating the law on public-private partnerships and developing the Governorate Development Fund to create job opportunities around Jordan.